Cadet Records Manager Version 3 Release now available!! Mega-Data Services is committed to delivering only top-quality custom software packages to our clients, and providing top-quality after-purchase support for our products. Our specialty is the creation of software for specific lines of business, customized to your exact needs. With over 35 years of software design and support experience, you can be assured that your requirements will be met with quality and professionalism. CADET RECORDS MANAGER VERSION 3 NOW AVAILABLE! 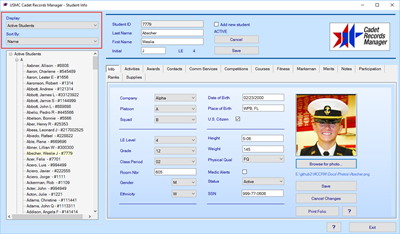 Version 3.0 of Cadet Records Manager for U.S. Marine Corps JROTC is now available. Questions? Please call us at 561-798-3940 or email us at support at mega-data.com . Microsoft Access is no longer required. Version 3 uses a self-contained SQL Server database. Better handling of supply items - tracking by NSN will no longer be required. Better handling of supply items - the ability to define a package of standard items to be issued to each cadet, eliminating the need to enter each item separately. We welcome your continued suggestions for improvements and new features. Please contact us to give us your ideas.